It is essential that OH providers and those in need of OH services are clear on their specific requirements. Service level agreements can help to clarify such information in order to ensure smooth running of the contract. Nic Paton reports. Service level agreements (SLAs) have long been part of the occupational health landscape but, with standards for providers becoming more crystallised and benchmarked by initiatives such as the Safe Effective Quality Occupational Health Service (SEQOHS) standards, getting the SLA right and knowing what to put in it has never been more important. As a minimum requirement for meeting SEQOHS, as the standards make very clear, an OH service “must define an explicit service level agreement for each customer organisation so that customers understand from the outset what they can expect from the service”. SLAs also have an important role in the accreditation process as evidence of quality of provision and delivery; for example, in showing access to an accredited specialist in occupational medicine to provide clinical supervision of services provided or the process of referral or reporting of injuries. A provider can also use an SLA as evidence of “the range of services that are included and excluded in the contract for services as well as target waiting times for appointments and the process for providing feedback to employers on suspected and confirmed new cases of work-related ill health”. “What clients tend to want, inevitably, from an SLA is the personal touch. They need to be able to understand how they can reach a doctor quickly and the sort of services they are going to be getting. They need it to be joined up for them,” explains Judith Howard-Rees, managing director of Gipping Occupational Health. “It is about helping an employer get to a point where they can say ‘I feel good about my duties to my employees’ and giving them value. “How, of course, you get that sense across in something like an SLA is hard, and will vary from agreement to agreement and provider to provider. But that is the sort of feeling you want to be trying to get across,” she adds. “In OH, it doesn’t matter whether you spend £5 or £500 on a piece of advice – if it doesn’t help you resolve or progress your case it is worthless,” agrees Andrew Noble, managing director of provider Health Management. “So you need to focus on outcomes, not the speed of which it arrived,” he says. One of the challenges of drawing up and managing an SLA is that OH providers may often be providing advice that employees do not necessarily want to hear, Noble adds. It is also important that an SLA is clear, measurable and achievable, emphasises Mike O’Donnell, chief medical officer at Atos Healthcare. “You need to be making sure you are not setting the SLA at such a difficult level that it is impossible to achieve,” he points out. 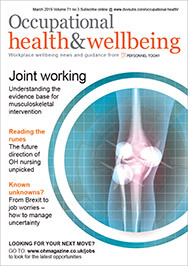 “From a legislative perspective, the OH provider should be advising the client on what medical assessments or components they require to ensure they are compliant, and for high-risk roles or environments a clinician should normally be involved,” recommends Suzie McGonigal, business development manager at Aviva Health UK – Occupational Health. “From an absence management or low-risk environment perspective, the OH provider should be offering types of services and delivery methods to suit the client’s specific requirements, objectives and budget. So, it is important that the client openly discusses with the provider why they require the OH service, what their service priorities are and its overall objectives,” she adds. For a management referral or absence management service to be successful, the referring manager needs to be asking the right questions of the OH provider, she continues. It is also important to ensure that a full service implementation plan has been created and, equally as important, that both parties have had input to it. “It’s important managers understand what they should or shouldn’t ask and what outcomes they should and shouldn’t receive from their OH provider. A good provider will be able to provide advice and training to HR or managers to ensure such a service is appropriately used and to its full capabilities. For example, the Aviva Independent Referral Service also includes a telephone call with the referring manager before and after the employee consultation to discuss the case,” says McGonigal. It is a good idea for the occupational health provider to appoint an account manager or, if it is not a big enough organisation to warrant that, simply a regular, good point of contact (POC) with the employer, stresses the Association of Occupational Health Nurse Practitioners (AOHNP). “Again, if the employing company is large they should have their own POC. This ensures a good open relationship is established. POCs need to be senior enough to make decisions autonomously. This ensures that the SLA agreed is then on realistic and deliverable terms and built on honest expectations from both sides,” says the organisation. “The employer will have completed a specification for the level of service required as part of the tendering-for-service process and it is from this and the document outlining what the service provider has to offer that any SLAs can be determined. These will cover such items as who pays for what in the contract – itemising what are the extras, for example, health promotion events, cover for short-term absence, travel expenses, required training, etc. “There will also be service standards – who is responsible for day-to-day management of the contract, the employer POC or the contract manager – patient directives, level of information to managers, style of referral, content and standard of reports, style of letters to external consultants/GPs and so on,” it adds. Monitoring of the SLA needs to come down to regular liaison, initially at monthly intervals but extending to quarterly meetings once the contract has bedded down. Such meetings should be relatively formal, with minutes and an agenda so that audit is easier. The service provider should supply an action plan fitted to the needs of the employer but also with regard to current legislative and good practice in the OH field. “The provider and employer should agree on branding on paperwork and documents; what guidance notes are to be written for users of the service, what other information might be available – for example, the organisation’s website, health-promo displays, information and events. The employer should prepare a report of the service to the provider annually. “Customer satisfaction should form part of the process as well as management satisfaction as to how the actual service is delivered and ease of use. There may be a need to have a senior management meeting at set times during the contract where any strategic discussions can be made with senior people from the employer and the contract,” adds the AOHNP. Inevitably, what needs to be in an SLA will depend on what services are being purchased. For example, suggests Mark Simpson, medical director at AXA ICAS, if it is post-offer health assessments you want, you’ll need to include details such as what timeframe they should be turned around in. Or if the SLA is about an absence helpline, it will need to pin down issues such as how many calls need to be answered within 30 seconds. “It is really about transactional hygiene. What do you need to have in place to review the quality of the service?” he asserts. Other details that will probably need to be in there include timelines for assessment, how quickly people will get in front of a clinician, how long customers should expect to wait for a medical report and so on. “It is simply about making sure the services within the SLA match the needs,” he adds. In the context of SLAs, key performance indicators (KPIs) and benchmarks will commonly be almost interchangeable terms, suggests Simpson. “KPIs should tell you about service performance rather than operating issues. So it might perhaps be a question of quality management and scoring, for example, through the use of employee feedback, service user feedback, a satisfaction survey. KPIs should measure how effectively overall is the service delivering,” he argues. You need some clear mechanisms to sample and record the quality of delivery, stresses O’Donnell. “You need to have a clear set of criteria for auditing,” he says. This can include having things such as agreed, measurable goals/benchmarks that the customer and service provider both work towards, proper case histories and up-to-date records, advises Judith Howard-Rees, managing director of Gipping Occupational Health. It also makes sense to have KPIs in place for critical success issues (see above) and to hold regular meetings with all key stakeholders and the OH provider to review the service delivery, recommends Suzie McGonigal, business development manager, Aviva Health UK – Occupational Health. “The OH provider’s management information should report on their delivery against the business specific KPIs. Provider and client tracking systems for relevant elements of the SLA should be in place,” she adds. Other useful elements could include online “live” tracking of each case to ensure true visibility of the service being provided and an agreed long-term plan for the OH service requirement and objectives. On the one hand, getting the small print right is what you pay expensive contract lawyers for, suggests Simpson. “At the end of the day you should be avoiding small print. It needs to be as transparent as possible,” agrees O’Donnell. Nevertheless, there are things to look out for: additional or hidden costs, “get-out clauses”, issues around whether allocated resources will be appropriate or reliable, advises Howard-Rees. Other things to look out for include who pays for attending conferences/training days, who pays for travelling expenses, the length of the contract, stipulations for renewal, extension or termination of the contract and notice periods, suggests the AOHNP. TUPE provisions and employment issues such as misconduct, disciplinaries, grievances, complaints, rewards and clinical governance should also be covered by the small print, it adds. Ultimately, an “informed” client is one who negotiates their contract terms with the provider, not vice versa, suggests Paul F Faupel, head of campus health and safety and scientific facilities at the Wellcome Trust Sanger Institute, speaking in a personal capacity. “He who pays the piper calls the tune. The client controls the small print, not the provider. Avoid as far as possible acceptance of the provider’s contract terms,” he recommends. It is in many respects basic customer relationship management, but the supplier essentially needs to identify what would be considered “added value” and how they are going to “go that extra mile”, suggests Howard-Rees. “It is about trust and recognition and needing to go that extra mile when there is a critical situation. On the one hand, you cannot go the extra mile every day if it is going to be an enduring relationship, but there has to be trust and commitment on both sides,” agrees Simpson. Not only does there need to be a strong relationship, it needs to consultative, open, include “periodic objective setting” and service development reviews, and, for high-risk environments, be very clear about when and how clients are going to be able to access or get input from relevant clinicians, advises McGonigal. Regular meetings and clear lines of communication can ensure any issues can be dealt with before they grow out of proportion and provide an opportunity for the terms of reference of the SLA to be “tweaked” to reflect any changing business needs or realities/practicalities of service provision/unforeseen circumstances, adds the AOHNP. The most obvious, and the most common, problem when it comes to SLAs is a mismatch of expectation. Such a mismatch can only be resolved by ongoing, clear communication, agrees O’Donnell. “It comes down to good communications and really ensuring you are listening very carefully to what the customer is telling you,” he adds. Trouble-shooting around SLAs inevitably comes down to good account management, argues Simpson. Account management in this context needs to be “proactive rather than reactive and waiting for a problem to arise”, he stresses. Inevitably, it helps if you can build strong relationships and lines of communication with relevant managers/personnel, agrees Howard-Rees. “Respond promptly and act quickly to overcome any problems. Be aware of customers’ culture, business goals and day-to-day priorities,” she asserts. A clear complaints procedure can also be valuable, recommends McGonigal. “Clear responsibility, reporting and communication lines should be defined for the contract duration,” she argues, and there should be “open communication and a strong relationship with the OH provider to ensure a quick and effective response”. At a practical level, complaints or service-delivery issues need to be raised, not left to fester, with regular contract review meetings built into the SLA to ensure that any issues have been resolved or escalated appropriately, as well as to identify any trends. “It is about an ability to demonstrate flexibility and adapting to changing needs,” according to O’Donnell. Just as all key stakeholders – HR, health and safety, occupational health, in-house clinicians and so on – should be involved with the contract set-up, ongoing contract review meetings need to be “worked” to build relationships and ensure people’s different priorities and requirements are considered, stresses McGonigal. “For high-risk workers or environments a named occupational health adviser or occupational health physician should be involved,” she says. It simply comes back to proactive account management, suggests Faupel. “Don’t wait to get problems resolved, pick up the phone,” he stresses. It also comes back to having sufficient time and resources, as well as a willingness, to speak to the client and vice versa, good implementations and good setting of expectations from the start of relationship, explains Andrew Noble, managing director of provider Health Management. “It is no different to getting married. The successful marriage deals with a lot of the difficult issues up front,” he says.